For Ganesh Chaturthi we make variety of Kozhukattai to offer to Lord Ganesh(Pillaiyar).The main one is the purana kozhukattai made with the channa dhal stuffing in my mom's place. 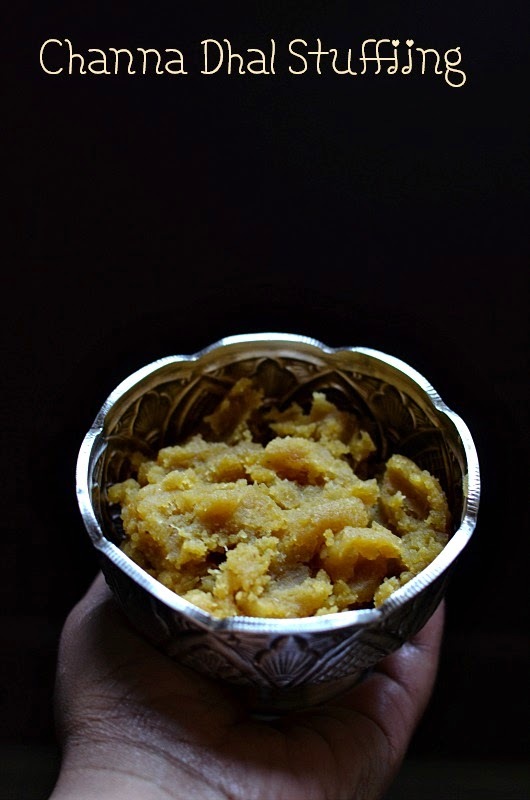 Pressure cook the channa dal in a pressure cooker or open pot till it becomes soft not mushy.After cooling drain the excess water and powder the chann dhal in a blender.Mean while melt the jaggery with little water and strain it. Heat a pan and fry the grated coconut and add the powderd channa dhal,add in the jaggery syrup.Mix it well and cook it a medium flame till it becomes thick.Finally add the cardamom powder and put off the flame.The stuffing is ready. (Click here for the stepwise pictorial for the puranam). 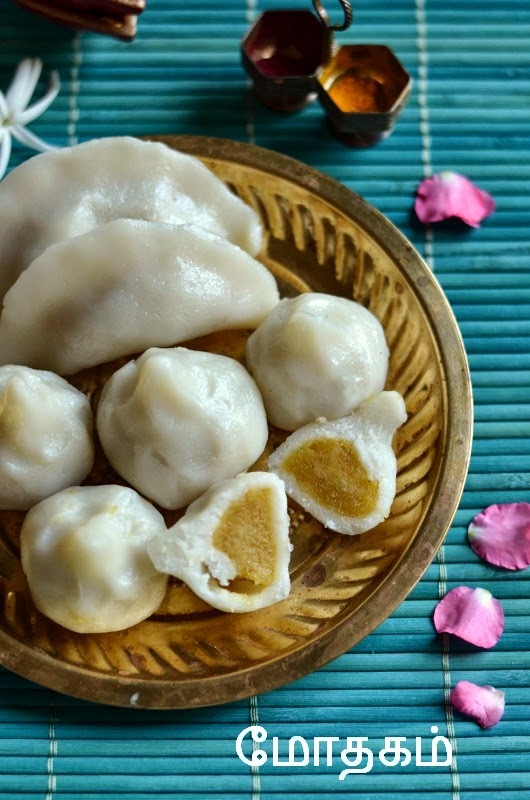 Take the rice flour,salt,1 tsp of oil in a bowl,boil the water till bubbles come.Add the boiled water slowly to the rice flour and mix it well with a spatula.Let it cool for a minute,now with the hands roll it to a smooth dough and keep it covered. Now greas the finger and palm withthe oil and take a big gooseberry size of dough,flatten it to disc.Keep a tsp of stuffing,pull the edges to the center and make a modagam shape or cover it like a semi circle to make the kozhukattai shape. 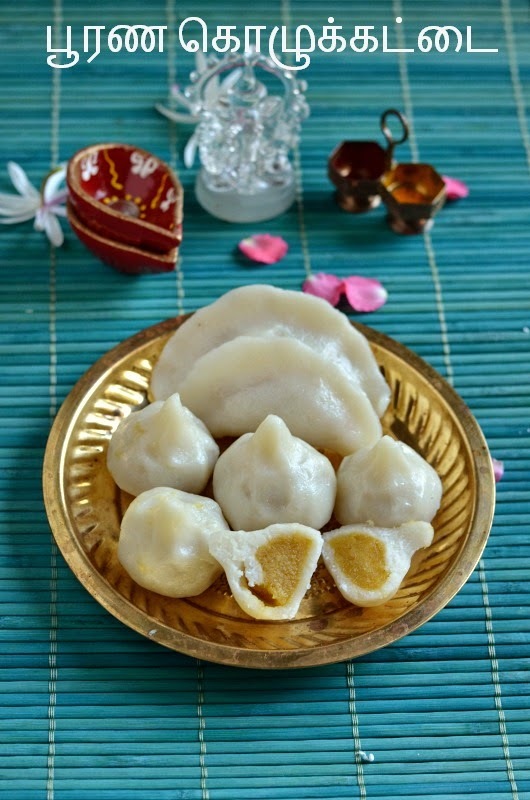 Keep the prepared modagam/kozhukattai on the idly plate.Heat the idly steamer with water,after the water boils,keep the idly plate inside and steam it for 10 minutes.After its cooked carefully transfer it to plate. The amount of water for the outer layer depends on the quality of rice flour. Keep the dough covered to prevent drying. The stuffing may be bit loose when it is hou but after cooling it becomes thick. To make it easy and convenient roll the stuffing to a small ball and keep it. Check out my fellow bloggers who is participating in Blogging Marathon #43. Awesome clicks! Very nice presentation. Wholesome and lovely looking kozhukattais. Excellent preparation. One of my favourite stuffing,can munch as much as i can..
Belated festival wishes. The kozhukattai look yummy. 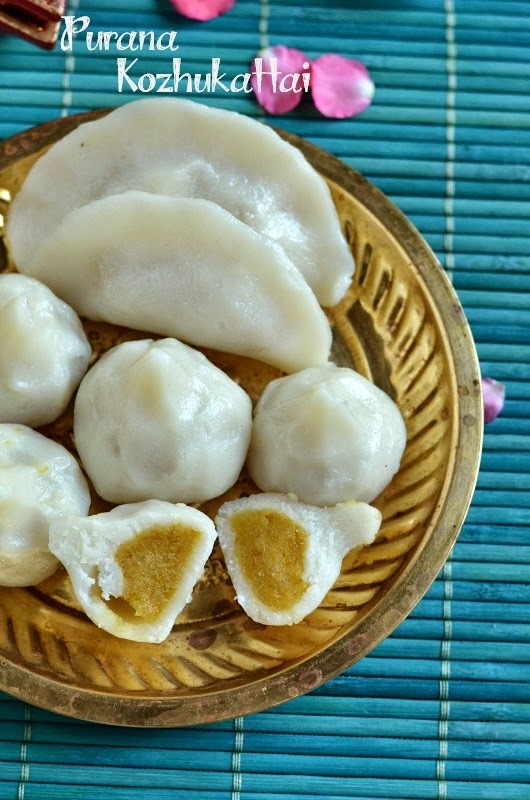 Such beautiful pictures, the kozhukattai looks super delicious!